In 1810 Abraham Cressman purchased 200 acres in the area that became the hamlet of Strasburg, Ontario (now part of the city of Kitchener). A number of Mennonite families established farms nearby in the following decades, and by 1833 these families began to meet for worship informally in each other's homes. One of these was the David Weber home, across the road from the present Pioneer Park Christian Fellowship. By the 1840s a meetinghouse was built for worship. Some believe that a log meetinghouse was built in the late 1830s and used until a frame building was completed around 1848. In 1837 a deacon, David Sherk, was ordained to serve the group and one year later was he was ordained as minister. In 1840 John Steckle became the minister. David Weber donated one acre of land in 1842 to provide a building site for a place of worship and a cemetery for the new congregation that became known as the Weber Mennonite Church. The deed for this property was drawn up 23 March 23 1854. In 1894 a new brick building was constructed. An additional acre of land behind the existing lot was purchased in 1951. A complete renovation and enlargement of the building took place in 1971-72. The Strasburg community changed rapidly in the late 1970s when many local farms were purchased by the City of Kitchener and private land developers for residential and industrial expansion. Several church families moved away as the congregation dwindled to 35 people. These were difficult and discouraging times, and the church faced the decision whether to close its doors or to open them wider. The Weber congregation changed its name in 1972 to Pioneer Park Christian Fellowship Mennonite, as part of its desire to identify geographically with Kitchener’s new Pioneer Park subdivision. By 1980 a new brick building was built beside the original meetingplace, and the old facility dismantled. "History." Pioneer Park Christian Fellowship. Web. 5 January 2017 http://ppcf.ca/history/. Mennonite Reporter (30 March 1981): 14; (8 June 1981): 4; (15 June 1992): 15; (11 January 1993): 1, 3. Rogalsky, Dave. "Pioneer Park celebrates 175 years of change." Canadian Mennonite 21, no. 20 (23 October 2017): 18. Snider, Esther. 135th anniversary 1842-1977: a History of the Pioneer Park Christian Fellowship. Kitchener, Ontario: The Church, 1977. By Simon B. Martin. Copied by permission of Herald Press, Harrisonburg, Virginia, from Mennonite Encyclopedia, Vol. 4, p. 906. All rights reserved. 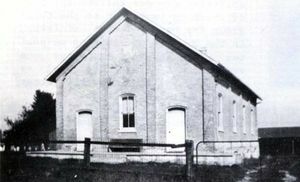 Weber Mennonite Church (Mennonite Church), located four miles southwest of Kitchener, Ontario, a member of the Ontario Mennonite Conference, was organized in 1838. The first meetinghouse was built in 1842; it was replaced by a brick building in 1895, seating capacity 150. Simon Martin served as pastor 1931-1958 and in 1958 was still serving as bishop, with Lester Bauman as pastor since 25 May 1958. The membership was 73. Steiner, Sam. "Pioneer Park Christian Fellowship, Mennonite (Kitchener, Ontario, Canada)." Global Anabaptist Mennonite Encyclopedia Online. January 2017. Web. 21 Apr 2019. http://gameo.org/index.php?title=Pioneer_Park_Christian_Fellowship,_Mennonite_(Kitchener,_Ontario,_Canada)&oldid=162313. Steiner, Sam. (January 2017). Pioneer Park Christian Fellowship, Mennonite (Kitchener, Ontario, Canada). Global Anabaptist Mennonite Encyclopedia Online. Retrieved 21 April 2019, from http://gameo.org/index.php?title=Pioneer_Park_Christian_Fellowship,_Mennonite_(Kitchener,_Ontario,_Canada)&oldid=162313. This page was last modified on 2 November 2018, at 09:46.